M.E. Control and Instrumentation Engineering is a 2-year postgraduate degree program, the minimum eligibility is B.E./B.Tech from a recognized school board or its equivalent exam. The average tuition fee charged for the course in India ranges between INR 10,000 to 4 Lacs, for a span of 2 years. Admission to M.E. Control and Instrumentation Engineering course depends on the basis of candidate’s performance in a relevant entrance exam, and subsequent round of counselling. M.E. Control and Instrumentation Engineering program requires sound learning and knowledge of physics, mathematics, chemistry, electronics and process control. Course concentrates on the principle, and operation of measuring instruments, which are utilized in configuration and design of automated systems. The course is useful to guarantee that these systems and process works proficiently, safely and securely. After this program candidates be able to apply for Chartered Engineer status when they graduate as this program has been produced to cover all the requirements and build up the skills and knowledge employers are searching for in territories such as aerospace, automotive, scientific, petrochemical or manufacturing applications. Candidates can get career opportunity in R&D units of public and private sector organizations. They are additionally hired by the Heavy industries for example Steel Plants, Refineries, Thermal Power Stations, and Cement and Fertilizer Plants. Such postgraduates are hired in capacities such as Instrumentation Engineer, Manager & Deputy Manager, Instrumentation Control Systems Engineer, etc. A fresh graduate in this field can earn an average salary between INR 4 to 12 Lacs per annum. Top Recruiting Companies GAIL, National Instruments, HPCL, ABB, Larsen & Tourbo, IOCL, SAIL, Robert Bosch, Invensys, GE, Suzlon, Apna Technologies, Whirlybird, ESSAR,etc. Top Job Areas Railways, Construction Companies, Telecommunications Sector, Automotive Companies, Oil and Gas/Power Generation/Energy Companies,etc. Top Job Positions Instrumentation Engineer, Manager & Deputy Manager, Instrumentation Control Systems Engineer, Supervisor, Asst. Manager, Instrumentation Designer & Engineer, Executive Trainee, Lecturer/Professor etc. M.E. Control and Instrumentation Engineering: What is it all about? M.E. Control and Instrumentation has extensive variety of applications beginning from everyday life to space investigation. In the present information age, numerous organizations are putting expanding demands on continuous availability to enhance business planning and decision making, and to get data that can show their monetary, ecological and environmental performance. Fast headway in technologies likewise gives challenges as organizations require confirmation that their control system investments will convey effective operational execution of their plants and financial returns. Consequently control and instrumentation frameworks assume essential parts in plant operation, as well as in diminishing the cost of generation while maintaining or potentially upgrading security. Accordingly, it is critical that control and instrumentation systems are managed efficiently and economically. With the expanding utilization of digital technologies, new strategies are expected to solve problems related with different parts of digital control systems. M.E. program in Control and Instrumentation Engineering is planned to investigate the previously mentioned challenges and furthermore initiate research activities. This program furnishes essential theoretical background with a decent mix of applied mathematics alongside top to bottom scope in examination of different control and instrumentation systems. The core courses incorporate economic, automatic, efficient and reliable control and instrumentation with an extensive variety of electives in electives in flight dynamics, robotics, power system, electric drives, micro controllers etc. This is a PG course that can be done after getting Bachelor’s Degree in Engineering. Interested candidates should have B.E./B.Tech. Degree in Engineering streams such as- Electrical, Electronics and Communications, Electrical and Electronics, Mechatronics, Mechanical, Instrumentation and Control Engineering from a recognized college or University. In some Institutes, minimum marks criteria may also exist for the admission. It may differ for different institutes. Admissions are basically offered through entrance test due to high competition in this field. Candidates performing well in entrance test get shortlisted for the program. Numerous institutes also conduct interview sessions for further screening of applicants. Control and Instrumentation have discovered their way into the most of manufacturing industries and plants, Electronics and Telecommunications sector etc. So, qualified Control and Instrumentation professionals are required by such industries that deal in production. Aside from them, some other prominent sectors offering employment to M.E. Control and Instrumentation Engineering degree holders’ are- Robotics sector and Artificial Intelligence sector. Starting salary is generally around INR 30-45k per month. 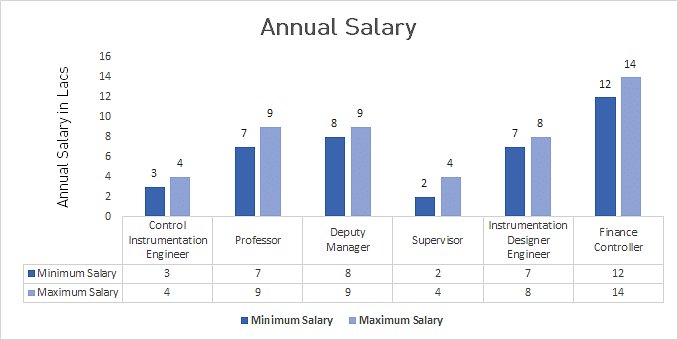 Salary may increase on the basis of- profile of employer, quality and nature of college from which program has been pursued, grades achieved and so on. Post-Graduates may likewise work as consultants or they can work as an independent control system as well as software developer.